The modern separators differ in many aspects from those first used at Wairakei during the 1950s. They differ in size, location, body arrangement, separated water vessel, two-phase inlet nozzle, water outlet nozzle, steam outlet nozzle, and efficiency. The original Wairakei separators were wellhead separa­tors. Each wellhead has its own small separator handling the capacity of a single well. It can be as small as 750 mm diameter and 2 m high, handling about 20 tonnes/h of steam. A modern separator can be larger than 3 m in diameter and 15 m high, and it operates as a separation plant, accepting well output of several large wells. It can handle 600 tonnes/h of steam and is rated at more than 60 MWe. the body exiting from the side. This is to improve the efficiency of water discharge to the water vessel, minimize erosion if the water is laden with solids, and minimize the risk of debris entering or blocking the water outlet pipe. The Weber separator has an efficiency that produces steam dryness exceeding 99.9% at design flow rates. 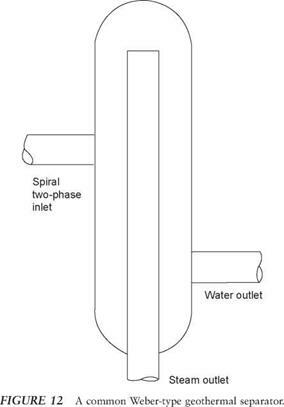 A modern separator design is an integral design that does not have a separate water vessel. Some modern designs incorporate an integral horizontal water vessel to reduce the height. To reduce height and earthquake effect further, large horizontal separators can be used.